In printmaking, I think it would be perfectly reasonable never to destroy the images on the plates and stones, and always to have them available for use in new works, new combinations. Jasper Johns was born in Augusta, Georgia, in May 1930. His desire to be an artist dates to his childhood, which he spent in several rural South Carolina towns. Johns studied art for three semesters at the University of South Carolina before moving to New York in 1949. There he attended classes at Parsons School of Design and worked at a variety of odd jobs before serving in the army during the Korean War, including a period in Japan. When he returned to New York in 1953, Johns engaged with contemporary philosophy, poetry, music, and dance, and he immersed himself in the visual arts, undertaking an intellectual as well as a visual pursuit. In January 1958, marking his first solo New York exhibition, his painting Target with Four Faces (1955) was featured on the cover of Artnews magazine, thrusting this virtually unknown artist into the public view. A master in many media, Johns is a printmaker of immense curiosity and skill. Since 1960, when he made his first lithographs, he has added etching, screenprint, and other techniques to his repertoire, and he has completed more than three hundred editions. Johns’ 1st Etchings, 2nd State, a portfolio of thirteen prints that was published by Universal Limited Art Editions (ULAE) in 1969, includes a title page and two versions each of six motifs: Ale Cans, Flag, Flashlight, Light Bulb, Paint Brushes, and 0 through 9, a configuration of superimposed numerals. Employing drawing and photographic processes, 1st Etchings, 2nd State adds to Johns’ meditation on the interactions of representation and abstraction. By 1969 he had established his practice of repeatedly examining—in paintings, sculpture, drawings, and prints—these and other "found" objects that he has referred to as "things the mind already knows." Although carefully rendered, his objects make no attempt to fool the eye. The works seen here are divided into three sections and highlight Johns’ reexamination of motifs through his variation of composition, material, and technique. The first section includes early images of four of the portfolio motifs; the second section exhibits prints and proofs for 1st Etchings, 2nd State; and the final section displays works postdating the portfolio that incorporate its imagery. Further highlighting the role of theme and variation in Johns’ prints are annotated working, state, and color trial proofs selected from the National Gallery’s recent and ongoing acquisition of the artists’ personal collection of proofs for his print editions. Including examples of the various print processes Johns uses, such as lithography, etching, and screenprint, these proofs differ from the editions in both subtle and substantial ways. Sumptuous working proofs with hand-drawn additions reveal Johns’ conceptual and technical process, while color trial proofs show alternatives to the editions that are equally coherent and "finished." Many printing processes, including lithography and etching, reverse the drawn image. This indirectness of printmaking, as well as its capacity to generate multiple variant examples of an image, is sympathetic to Johns’ urge to revisit and manipulate iconography, materials, and processes in new and highly original combinations. He takes full advantage of the inherent potential of printmaking techniques to reverse and duplicate images, printing from his matrices in radically differing ways. Often setting his matrices aside after an edition is completed, sometimes for years, Johns then later reworks them for use in a new edition. He makes changes in the medium, in the quantity and character of drawn marks, and in the selection of surfaces to print. He also makes deliberate choices in regard to ink and paper and in the degree and placement of hand and press pressure during inking and printing respectively. With each variation, Johns presents a new set of circumstances to be acknowledged and accounted for. This section introduces lithographic versions of four of the six motifs in 1st Etchings, 2nd State—Ale Cans, Flag, 0 through 9, and Light Bulb. The first three are presented in their initial printed versions. Flag I and 0 through 9 are among Johns’ earliest prints, and they reveal his experimental vigor as he undertook a new process, using lithographic crayon to draw the linear 0 through 9 and a liquid ink called tusche to create rich washes in Flag I. Although this section presents early print versions of these objects, Johns had already been exploring these motifs in other media: Flag first appeared in a 1954–1955 painting; Light Bulb and 0 through 9 appeared in drawings of 1957 and 1959–1960, respectively (although numerals organized as a grid date even earlier); and Ale Cans was introduced as sculpture in 1960, in both plaster and painted bronze versions. Flashlight and Paint Brushes, first made as sculpture in 1958 and 1960, respectively, are not represented in this section. They entered Johns’ print oeuvre in the 1968 portfolio entitled 1st Etchings, which preceded 1st Etchings, 2nd State. State and color trial proofs for Ale Cans suggest ways the National Gallery’s collection of Johns’ annotated proofs illuminate the artist’s achievements, and show that testing visual possibilities and recording them in proofs are integral to Johns’ printmaking process. In a linear trial (left), Johns’ characteristic hatchings, squiggles, and outlines define Ale Cans and its surrounding space, unbounded by the loose, broken line that subsequently encloses a portion of the field. One color variant, lacking the red and green details on the label (middle), shows Ale Cans emerging more vividly from the background than in the edition impression (right). The title 1st Etchings, 2nd State declares the technique Johns used to create the prints (etching); it also indicates that they are the first series he completed using this process and informs us that these are the second versions (states) of the images. Such specificity and precision are central to Johns’ approach to his work in all media. His clarity requires a viewer to make an equally careful reading of the art in order to grasp the distinctive nature of individual but related prints that initially may look identical. In this section, each sheet from the 1st Etchings, 2nd State portfolio is accompanied by related proofs that document many of Johns’ decisions while developing the series. Also on view are trial proofs (1967–1968) for an earlier portfolio for which these plates were previously used, entitled 1st Etchings. The proofs are close to the edition impressions, but use different papers. In addition to the title page images, 1st Etchings and 1st Etchings, 2nd State include both a hand-drawn, etched representation and a photoengraved image of Ale Cans, Flag, Flashlight, Light Bulb, Paint Brushes, and 0 through 9. In 1st Etchings, the drawn and photoengraved images of each object are printed together on a single sheet (left), whereas in 1st Etchings, 2nd State, the plates are printed individually (middle and right), doubling the number of prints. In addition to separating the drawn and photoengraved images in 1st Etchings, Johns reworked all of that portfolio’s copperplates to produce 1st Etchings, 2nd State. (Although 1st Etchings is not titled 1st Etchings, 1st State, the prints essentially became "first states" once the second portfolio was made.) For the second states, Johns added aquatint or open-bite areas (left) to all the line etchings (right) and added etched lines and open-bite fields to the photoengravings. Throughout the process, the printer made proofs that enabled the artist to evaluate these changes. The assembled proofs for the two portfolios show many of Johns’ concerns as he developed each series and reveal variations in ink colors and tonalities, as well as in paper formats, textures, and sizes. Three proofs for 1st Etchings: Paintbrushes, for example, show that Johns experimented with different placements for the etched and photoengraved plates, layering them atop one another in two examples and eventually setting them adjacent to each other on the page. Later works incorporating motifs from 1st Etchings, 2nd State are on view in this section, showing some of Johns’ subsequent explorations of relationships among these images and other materials and processes, as seen, for example, in Savarin. Introduced here are other print media Johns had been exploring— screenprint (Flags I) and monotype (Savarin)—as well as his first uses of offset lithography (Decoy, Decoy II, and Two Flags). Unique working proofs in this section include Light Bulb (left) and 0 through 9 (right), both of which are so extensively redrawn in chalk that their tactile properties more readily evoke a drawing than a printed image. Among the most distinctive works are Flag and Numerals, 0 through 9 from a group of six Lead Reliefs Johns made in collaboration with the technologically oriented staff at Gemini G.E.L. about the same time he completed 1st Etchings, 2nd State. For the reliefs, thin sheets of lead, of a dull, unpolished finish that corresponds to the gray hues associated with Johns’ art, were placed in molds made from the artist’s carefully manipulated wax and plaster models and converted into relief images using a hydraulic press. The fragile embossed sheets were then mounted on rigid surfaces for stability. In 1971, Decoy (left) marked the first of only two instances in which Johns made a print first and followed it with a painting based on the image. A photograph of an actual Ballantine can is at the center of this elaborate nineteen-color offset lithograph, and the relief surfaces of the canceled photoengraved plates from 1st Etchings, 2nd State have been transferred to a lithography matrix and printed as a frieze across the bottom. One of the Decoy proofs, printed in black, defined all the major elements and determined the placement of subsequent colors. Other proofs show subtle variations in both composition and color, including one that is extensively reworked in crayon, wash, color pencil, paint, and chalk. A group of Decoy proofs in which the frieze had been too lightly printed was set aside and excluded from the published edition. In 1973 these became Decoy II (right) when the artist reworked them, adding seven new matrices. All the works in this exhibition were made more than two decades ago. 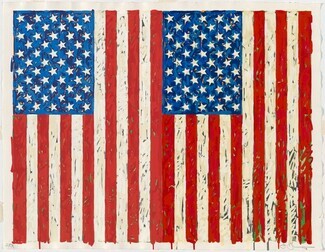 Today Jasper Johns remains committed to making prints, creating multiple original works of art that mine the distinctive coordination of iconography, method, and material with the fresh vision and experimental impulse that mark this earlier work. Employing traditional techniques used by Rembrandt (etching) and Goya (etching and lithography) centuries ago, as well as the more modern photoengraving and screenprint processes, Johns continues to challenge his viewers, as he challenges himself, to reconsider the boundaries and meanings of representation and abstraction. Overview: Jasper Johns' 1969 portfolio 1st Etchings, 2nd State was on view in this exhibition together with additional works created by the artist before and after the portfolio. They included prints selected from the collection of the National Gallery of Art and loans from the artist. The presentation explored the evolution of the artist’s use of six motifs: ale cans, paint brushes, a flashlight, a light bulb, the American flag, and 0 through 9 (a series of superimposed numerals). Public programs presented in association with this exhibition and Jasper Johns: An Allegory of Painting, 1955–1965 included an auditorium lecture series during March, a special film program of documentaries about Johns and his collaborations with musicians on March 10, and a public symposium on April 28. Teacher and school programs included high school and teacher workshops. Sunday concerts in February featured the work of composer John Cage and other contemporaries of Jasper Johns. Organization: The exhibition was organized by the National Gallery of Art, Washington. The curator was Ruth Fine, curator of special projects in modern art. Sponsor: The exhibition was sponsored by The Exhibition Circle. 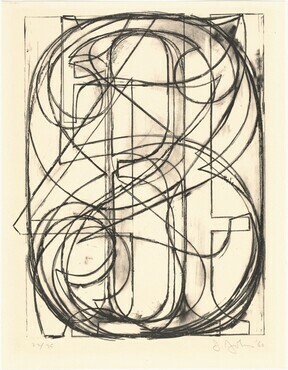 Brochure: States and Variations: Prints by Jasper Johns, by Ruth Fine. Washington DC: National Gallery of Art, 2007.